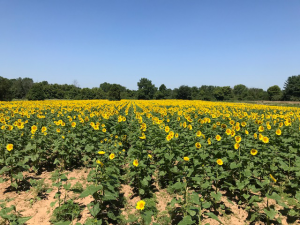 The sunflower fields at McKee-Beshers Wildlife Management Area in Poolesville are now in “peak bloom,” following the wet spring, and recent hot and sunny summer weather conditions. 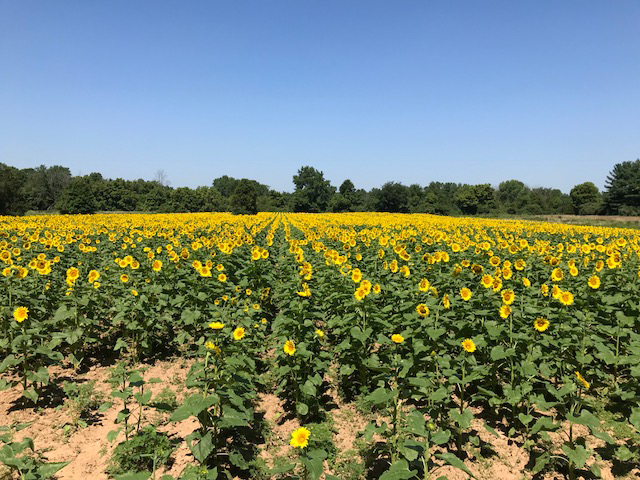 The Montgomery County area is just one of many sunflower fields the Maryland Department of Natural Resources plants each and every spring as a food source for pollinators, songbirds and other wildlife, particularly mourning doves, as part of its conservation and management programs. Visiting and photographing (department’s photo contest ends Aug. 31) the spectacular sight is encouraged and welcomed, but visitors are reminded that damaging, disturbing or picking the sunflowers is strictly prohibited. Sightseers should also be advised that while the wildlife management area is open to the public, there are no amenities such as garbage cans, restrooms, shelters or tables. Additionally, patrons should protect themselves from the elements, namely mosquitoes, poison ivy, ticks and – of course – the sun. Long pants and hiking shoes are strongly recommended. More information and updates on the status of the sunflower fields is available online. The feature article in the Maryland Natural Resource summer magazine (subscriptions available) also gives detailed information on why the sunflowers are planted and why it’s essential they be left untouched. Mourning doves are hunted at the fields during the traditional fall season, which runs Sept. 1 through early January.